Ever wish there was an easier way to fasten your boots with buttons? What about shirts? Well the good news is there is a way! You can simply use a buttonhook to fasten those pesky buttons! A buttonhook is a hook that draws small buttons through buttonholes; much like the buttons on Victorian boots. Buttonhooks have been around since the 1800’s and were not only used to fasten ones boots but also to help fasten gloves, clothes, and jackets. This was also an object that was used by both men and women of all social classes. A pair of boots, men or women’s could have up to fifty buttons a piece! With all those buttons, the buttonhook came in quite handy. To use a buttonhook the hooked end was inserted through the buttonhole and placed around the bottom of the button. By pulling and twisting one could easily pull the button through. 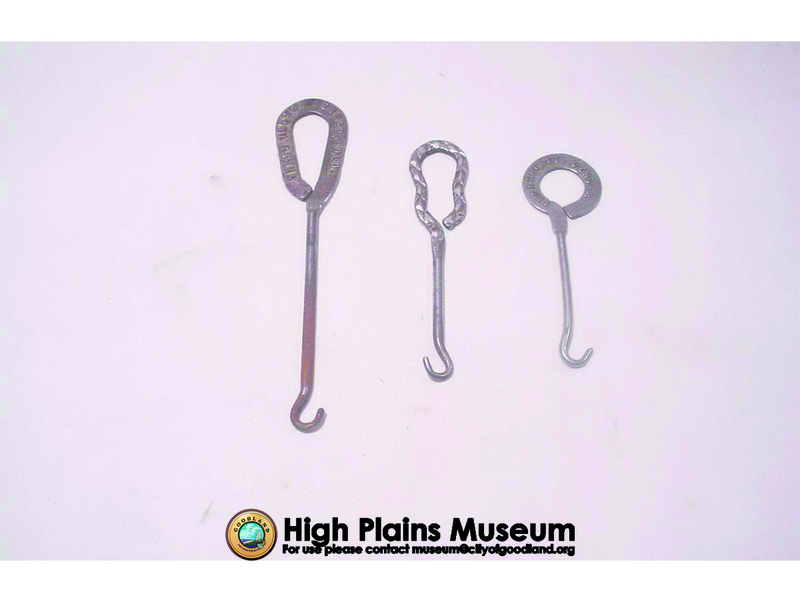 Buttonhooks came in all shapes and sizes and were made of a variety of materials. Some buttonhooks were small so that they could be easily carried, while others were more than a foot long. This length allowed the user to strap their garment without bending over. One such buttonhook was patented by James Clarence Beetle of New Bedford Massachusetts in 1884. The materials used to make these ranged from wood, brass, ivory, tortoiseshell, mother-of-pearl and gold. Some had intricate designs while others had a basic handle. on the right shows a gold colored buttonhook that was given away by C.M. Millisack for advertising. 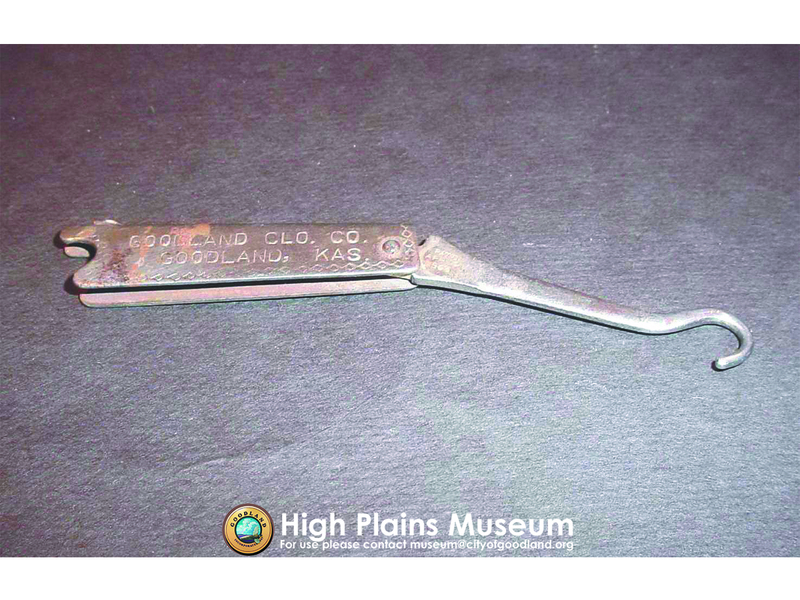 The buttonhook on the lower left shows a folding hook that came from the Goodland Clothing Co. 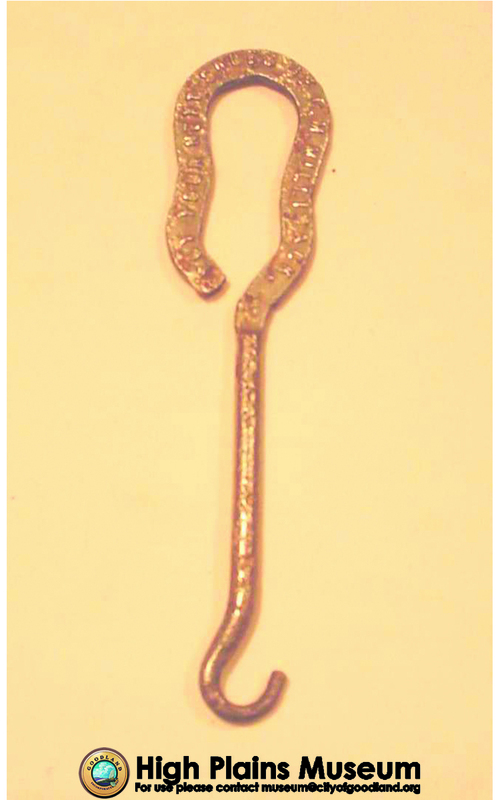 This would be an example of a buttonhook that could be carried with a person throughout their day. A buttonhook was an object that was found throughout every social class, used by both men and women for a variety of garments including boots. They came in many shapes and sizes and the materials used to make the buttonhooks varied almost as much as the size and shape. Do you think buttonhooks are useful? Have you used one? Please leave your thoughts in the comments section below.